1-John Butler. Sovereign of Athy was born about 1779 and died on 13 Nov 1852 in Ireland aged about 73. John married Frances Lapham on 28 Oct 1805 in Ireland. Frances died about 1828 in Ireland. They had five children: Frances, Susan, Anna Maria, Joseph Lapham and Elizabeth.Frances, Susan and Anna Maria all married and emigrated to Van Diemen's Land. Frances who married Captain Peter Maclaine in 1826. 2-Joseph Lapham Butler was born on 17 Oct 1819 and died on 6 Apr 1874 in Athy, Ireland at age 54. Joseph married Ellen Thomasina Pope on 20 Apr 1854 in Monkstown, Ireland. Ellen was born in Rheban Castle, Ireland. 2-Elizabeth Butler was born about 1825 in Ireland. Elizabeth married Christopher Graham on 21 Apr 1845 in Athy, Ireland. John Butler was the last Sovereign of the town of Athy. He lived in St. John's House in what is now Edmund Rice Square. The Borough of Athy was abolished in 1840 because it was one of the many undemocratic Boroughs where the twelve Burgesses who comprised the Borough Council were elected for life by the Duke of Leinster. Inevitably the Burgesses acted in accordance with the Duke's instructions and not the democratic will of the local people. Athy Borough was replaced by democratically elected Town Commissioners. 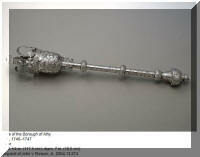 His ceremonial silver mace is now in the possession of the San Antonio Museum of Art, Texas, USA. 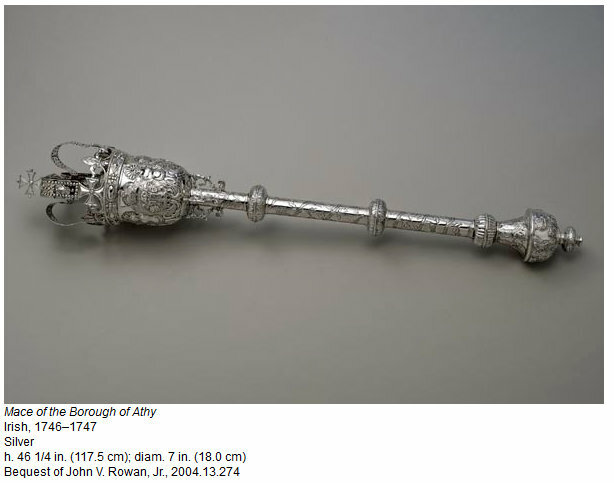 An inscription on the mace reads: "This mace, presented to John Butler by the Corporation of Athy, November 1841".